Our Young Adult Bible Study (YABS) group at church started our next study series. We've done Adventures in Missing The Point by McLaren and Campolo, most of the Nooma series from Rob Bell, and Crazy Love by Francis Chan, and now we're starting in the book of James (from the New Testament)...finally, we're going to study the Bible in our Bible study. We're not going to take a very academic approach, but last night we did discuss some more academic background information just so we'd have the right tools to be responsible with the text. I prepared some basic information about the book that I thought might be worth sharing. So here's what we discussed last night, enjoy! To whom: Jewish Christians outside Palestine. “To the Twelve Tribes.” James was written to a community of people, rich and poor, who were the faithful minority within a dominant culture which rejected their faith—hence the term “Diaspora”/“dispersion.” They were probably under persecution of some kind (as all early Christians were) facing hostility from those around them due to their faith, experiencing poverty and hunger in the face of their rejection, and experiencing subsequent division within their community (probably especially between rich and poor). 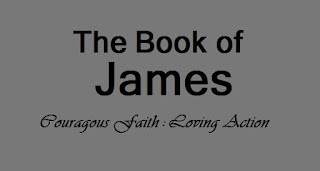 Most scholars seem to believe that the text is indeed pseuepigraphic and most scholars agree that the claimed author is indeed James, the brother of Jesus, as tradition has claimed. But in the late 1800’s and early 1900’s another option was developed. Three scholars L. Massebieau (France), Friedrich Spitta (Germany), and Arnold Meyer (a generation later) developed the theory that the text was originally solely a Jewish text, written by Jacob (son of Isaac), the father of the Twelve Tribes of Israel (Jacob and James share the same Greek name: Jacobos), obviously pseudonymously, to the Twelve tribes of Israel in Farther-to-Son form which is typical of Hebrew Wisdom Literature. The text was later claimed by Christians who provided interpolations/ additions, which clarified it as a Christian text. Some have argued that the text, having been attributed to Jacob and written to a Jewish audience, was a plea for Jews to reject the impending Jewish revolt and to live peacefully in the face of the temptation to violently oppose Rome (as the Jews eventually did). This whole Jewish/Jacob theory has been picked up and put down by scholars ever since Meyer completed it, but it has been widely rejected due to lack of positive evidence. When: assuming it was written pseudonymously, probably sometime “after the death of James ca. 62, in the range of 70-110; most likely in the 80’s or 90’s.” If it has anything to do with an impending Jewish Revolt then the original text was written some time in the mid-60’s prior to A.D. 70 when the city was destroyed. Location of origin: Some have suggested Pella, about 60 miles North East of Jerusalem where Jerusalem Christians are said to have gone before the destruction of the city during the Jewish Revolt in A.D. 70. Some have suggested Palestine or Jerusalem (due to the apparent familiarity with the typical Palestinian climate within the text in its’ mentions of early and late rain). Making a decision about location will depend on definitive dating and authorship. Message: The overall message of James is a call to faithfulness and a call to radical loving action in the face of division and rejection. The author calls out the dispersed communities to come together peacefully, to reject the temptation either to conform or to violently resist the dominant culture, to reject favoritism which so easily makes its way into desperate situations, and to put their faith into action by embracing their poor brothers and sisters and by rejecting materialism for the sake of loving obedience to God. It is a call to the original audience and to us today to find renewed wisdom from God in the face of all sorts of competing ideals and false wisdoms that swirl around us and are offered to us by dominant culture. According to Cain Hope Felder, James is an “urgent appeal for those who call themselves Christians to adopt a courageous faith that will help them cope effectively with the trials of life, and will produce in them heightened moral integrity and loving actions.” In this incredible book we are invited to discover what it means to follow Jesus, to live obediently and faithfully, and to then engage the world lovingly and mercifully as lovers of God and followers of Jesus Christ. Raymond E. Brown An Introduction to the New Testament (New York: Doubleday 1997) page 726. See George Arthur Buttrick, Interpreter’s Bible Vol 12. (Nashville: Abingdon 1957) page 9-10. Michael D. Coogan, The New Oxford Annotated Bible, (New York: Oxford University Press, 2001) page 386 New Testament. I would like to clarify that Jesus did not have any brothers. James was the brother of Joses (Joseph) who were close kin of Christ, probably cousins. Scripture actually states that their mother is Mary, wife of Cleophas and brethren of Mary, mother of Jesus. See Mt 27:56, Jn 19:25, Mk 15:47. There is far more in Sacred Scripture and Sacred Tradition that supports Jesus being an only child. Besides, wouldn't James also point to this fact at the beginning of his epistle. Also consider that Christ entrusted His mother to John the Evangelist not His "brothers" James or Joses (Joseph), as was customary for Jews in that time, right before He died. Anyway, James is an excellent epistle and there is much to learn there. Especially concerning the role of works one's salvation. thanks for the comment. I realize that this is a hotly debated topic for some people but I have never thought much of it. I respect the Catholic doctrine of the perpetual virginity of Jesus' mother but I don't find it necessary. I also don't find it worth arguing about, since the epistle of James is Pseudepigraphy anyway. I find it interesting that you do not believe that James the Apostle wrote the epistle. This knowledge has been kept and taught by the Church since the earliest fathers. Doubting the authorship of Sacred Scripture places doubt on the Scriptures themselves. Concerning Mary as Ever-virgin, this infallible dogma cannot be cast aside. It is a testament to the divinity of Christ. If the Ark of the Old Covenant was so holy it could not be touched because it contained the Word of God written in stone, consider Mary, the Ark of New Covenant who carried the Word made flesh. How holy must God have made her? Read the Magnificat (Luke 1:46-55) to gain a better understanding of what God for Mary.